When you live in Chicago, or in any large American City for that matter, its easy to fall into the "oh you gotta' go 500 miles away to find quality fishing experiences" mindset. It's simply not true. There are hidden treasures all around us. One of which is the Vermilion River, a sweet-and-tasty little tributary that meets the Illinois River as it flows near the Starved Rock State Park area, near Oglesby, Illinois, 90 miles west-by-southwest of Chicago, along Interstate-80. The Vermilion is Fly Fishing water. It's a gorgeously intimate and sequestered little river, averaging 40-to-60-yards wide. As it weaves its way through verdant-forested, deep-cut limestone and sandstone bluffs, it flows a light, mouthwash-minty-green in spring and fall; a tea-stained rusty-brown in the low flows of summer. Blanketed by great stands of native Illinois maples and oaks its beautiful, geologic rock formations, carved by great floods created as the glaciers retreated north 11,00-years ago, captivate the eye. An odd-sounding silence - occasionally punctuated by the wind in the trees, the splash of an effervescent smallmouth, or the cry of a bald eagle or redtail hawk - accosts city ears rendered numb by the dull, incessant roar of trains, planes and automobiles. 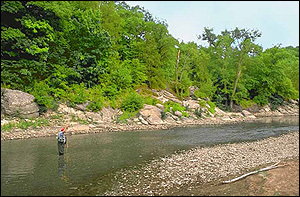 The most interesting section for fly fishers is the eight-to-eleven-river-mile stretch from the Illinois Route 178 bridge that crosses the river just above Mathiesson State Park, down to the take-out access-point bridge at the Ed Hand Highway, a 1/4-mile south of Route 71. Even though this is a popular section of river for white-water rafting, it runs through mostly private land with little access, and, as a result, sees few fishermen, and even fewer fly fishermen. Jake Krancic of Utica, Illinois invited me to fly fish on the Vermilion after reading an article which I wrote about the joys of finding "Close to Home Fly Fishing Adventures." Krancic told me he thought l might enjoy the spring white bass run, and really like drifting and wading the river in summer to work its riffles, runs and pools for smallmouth. I found enchanting fishing terrain; an inviting series of pools, rapids, riffles, and islands, with a hard-bottom of gravel, cracked slate-limestone and widely-spaced fist-to-bowling-ball-sized rock. There is little mud, muck or sand to speak of and the wading is pleasant and uneventful. Though nestled in a lushly- forested valley, the River's tree line is back-and-up from the water's edge and affords one ample casting room. 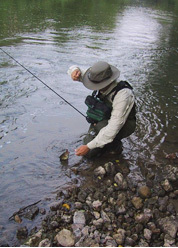 You can make short, pinpoint casts to work nymphs through six-to-eighteen-inch-deep riffles, along current edges and seams, or next to stone cuts, rounded bedrock or outcroppings. Or, you can cast long-and-graceful to drift a streamer, dry fly or small popper across the surface of a smooth-flowing run. The most delightful way to fish is to drift the river in a raft or canoe. Rafts are available at the Vermilion River Rafting Company located at the Route 178 bridge. You can alternately cast while drifting, or stop to wade-and-cast the most promising-looking water. This makes for a pleasant 3 1/2-to-seven-hours of fishing depending upon the water's flow and your own timetable. For those who don't wish to raft, access by foot is limited, but available. You can park at the Dells Area section of the Mathiesson State Park and walk half-mile walk to the river. Or if you park at the Vermilion River Area of the Park it's a half-mile walk downhill through scenic, forested-trails and across bridges. You can then wade upstream and/or down and enjoy some wonderful fishing. If walking is difficult for you, park at the Route 70 - Ed Hand Bridge where it crosses the river, and start fishing your way upstream from there. Each spring the Vermilion gets a run of white bass that come up from the Illinois River to spawn. The area from the Ed Hand Bridge through Mathiesson State Park on upstream to the property of the Lonestar Cement plant can be white bass heaven from May into June. (Don't venture up to the dam on foot. That's Lonestar property and they arrest all trespassers). "It's not uncommon, depending on weather and water conditions to have four-plus-weeks of really nice white bass fishing, with up to 30 hookups in an afternoon," said Krancic. "They aren't real big, running 12-to-15-inches, but a lot of fun on a fly rod, and, of course, delicious." In summer the Vermilions flow can drop to a trickle and the smallmouth concentrate in riffles, runs, and at the oxygenated heads-of-pools where they feed on young-of-the-year white bass, river shad, black nose dace and other minnows. "So naturally, small streamers can be tough to beat at this time," says Jake. "But, I like to drift a tandem-nymph rig - with one dark fly and one light, one bead-headed and one plain - though these pools and riffles. That's always been effective for me, at almost anytime of the year." And, according to Krancic, the good smallmouth fishing usually continues until early November. "They begin to feed heavily as the water starts to cool in September," said Jake. "But, regardless of the how the fish are biting, the early-October-through-mid-November fall colors are so rich and intense, that catching fish becomes almost secondary. I've lived here almost 45 years, and autumn on the Vermilion still takes my breath away." Spring and Autumn flies: woolly buggers, marabou and feather-wing streamers, zonkers, and bucktail streamers. Colors: black, yellow, white, grey, brown. sizes 4 to 10. Summer flies: Hare's Ears, Prince Nymphs, and other mayfly and caddisfly nymphs, in black, brown or tan, in sizes 8- to-14. Hellgrammites, rabbit strip or marabou leeches, and woolly buggers in black, brown, white, and tans, sizes 2 to 8. Small, sized 8-to-10, tan-colored cork poppers, and large dry flies like Humpys and up-wing mayflies work come evening. Fly Rods: 2-to-6-weights in 7-to-9-foot lengths, with weight-forward lines. The Vermilion River is what I consider a classic example of a "Close to Home Fly Fishing Adventure," offering fish, scenery, nature and solitude. While you're waiting for that once-a-year, once-in-a-lifetime trip to Alaska, Canada, or one of the western states, treat yourself to fly fishing opportunities like the Vermilion River. They're around. For information on Vermilion River Rafting, contact Bob Hearst, at (815) 667-5242. The Vermilion is also covered in the Illinois Canoe Guide, Book #2, by Phillip Vierling, 4400 N. Merrimac, Chicago, IL., 60630, for $5.95. You can also go to the search engine google.com and search for the Vermilion River in Illinois. Keep a pen and pad handy. Photos by Bob Long, Jr.